For Edition VI (2015–2016), If I Can’t Dance takes the notions of ‘Event and Duration’ as the field of research for its biannual programme of Commissions, Performance in Residence projects, reading groups, seminars and workshops. The programme of Commissions includes the production and presentation of new work by artists Leonor Antunes, Alex Martinis Roe, Naufus Ramírez-Figueroa, and Joke Robaard. If I Can’t Dance also continues its Performance in Residence programme, approaching performance-related practice through production-led research, with four new projects by Erin Alexa Freedman and Lili Huston-Herterich, Fred Moten and Wu Tsang, and Peter Pál Pelbart. Naufus Ramírez-Figueroa is one of four artists commissioned by If I Can’t Dance to produce a new work as part of Edition VI – Event and Duration (2015–2016). Using theatre, drawing, literature and sculpture, Naufus Ramírez-Figueroa’s work conjures live and sculptural representations that explore themes of loss, identity and displacement. Across the duration of Edition VI, Ramírez-Figueroa will develop a cycle of new performances that attempt to exhaust his interest in the Guatemalan Civil War as the recurring subject of his work. 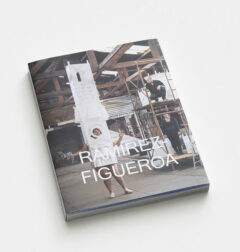 Ramírez-Figueroa’s new work is commissioned and produced as part of Corpus, network for performance practice. Corpus is Bulegoa z/b (Bilbao), CAC (Vilnius), KW (Berlin), If I Can’t Dance (Amsterdam), Playground (STUK & M, Leuven), and Tate Modern (London). Corpus is co-funded by the Creative Europe Programme of the European Union.